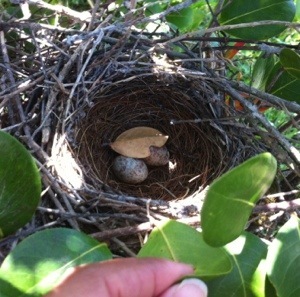 As I was walking around the far end of our property, I happened across a small neat nest in a Cocoplum bush. The bush has grown quite tall and wild and is home to an occasional rabbit or two. The mockingbirds either didn’t notice me wander so close to their nest or they didn’t care. I have had mockers nest right outside our. Front door and it seems they have come to know me. 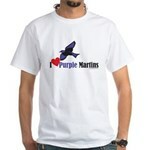 They pretty much ignore me and go about their business knowing I will do them no harm. It’s a wonderful feeling to be trusted in that way by a wild animal. The nest only has 2 eggs so I am sure it is not a complete clutch. Perhaps in a couple of days I will see her starting to incubate. These mockers are now the fifth species of bird to nest this year in our yard. First was our Screech Owls, then our Purple Martins returned (of course), then a Red-Bellied Woodpecker took up residence right outside our window, then a pair of Greater Crested Flycatchers took up house in the (now vacant) Screech Owl box. Our yard has become quite the haven of late for all sorts of wildlife. The vanishing waterfall is a favorite of the mockers, doves and a multitude of Common Grackles for a drink and bathing. The sunflower feeder feeds the woodpeckers, cardinals, bluejays, grackles and occasional Red-Winged Blackbirds.